Knowledge Press is publishing two International Journals and which is not supported or funded by any organization. KP is inviting you to submit your valuable research work for publication. KP is an open access publication. In the Gold OA publishing method, the publisher charges publication cost from the author and takes complete responsibility to make the article available online permanently for free to anyone from anywhere in the world. This is a reverse process to the traditional print publishing method where the reader is charged to gain access to the published articles and obtain permission to use them. Here the publisher holds copyright over the articles whereas in open access publishing, author attains copyrights over their work. KP is committed to disseminate all the scholarly journal articles published immediately and maintain perpetual free online open access to all groups ranging from an author to a common reader. KP encourages authors to publish and retain copyright over their research work, licensing it under the Creative Commons Attribution License. It grants an irrevocable right to access, reuse and redistribution with no restriction, until the original work is credited. Theme in Educational Studies (TES) is a scholarly, peer-reviewed journal that seeks the submission of unpublished articles on current educational issues. TES encourages debate, both theoretical and practical, on a wide range of topics that represent a variety of interdisciplinary, cross-disciplinary and trans disciplinary interests. 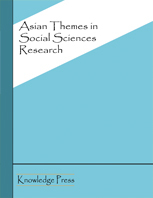 Asian Themes in Social Sciences Research (ISSN: 2578-5516) is an international, double blind peer-reviewed, open-access academic research journal, published by Knowledge Press. The mission of the journal is to provide an academic forum for discussing the issues of significant public interest across the world. 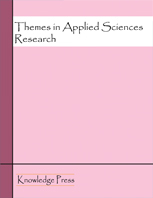 Themes in Applied Sciences Research (ISSN: 2578-5567) is an open access, peer reviewed international journal that publishes original research and review articles related to diverse areas of applied sciences. The main objective is to offer an intellectual platform to the international scholars and it aims to promote interdisciplinary studies in applied sciences.